For many people, visiting friends and family means staying in a small guest bedroom that, while comfortable, is rarely spacious. Lucky guests sometimes get their own bathroom or a basement area where they can enjoy quiet privacy in the mornings and evenings. The extremely fortunate, however, get to stay in this incredible county guest house built by John Harrison Jones Architect. With four suites, a large porch, and a stunning interior that makes many homes seem meager by comparison, this is the guest house that everyone wants to visit. We can only imagine the challenge when trying to get guests to leave! 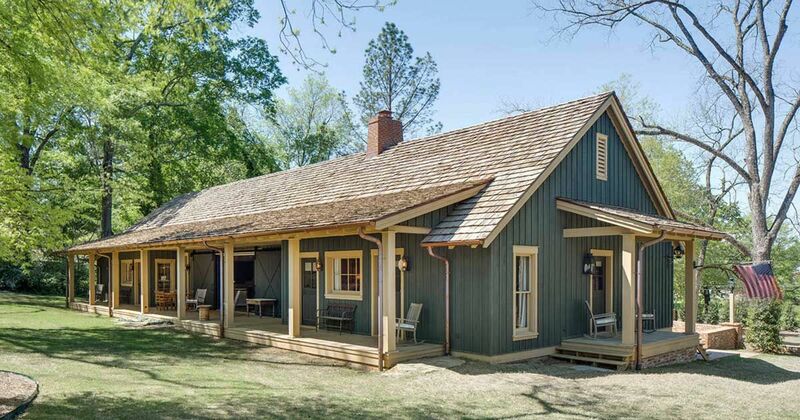 From the outside, this guest house seems more like a quaint barn. 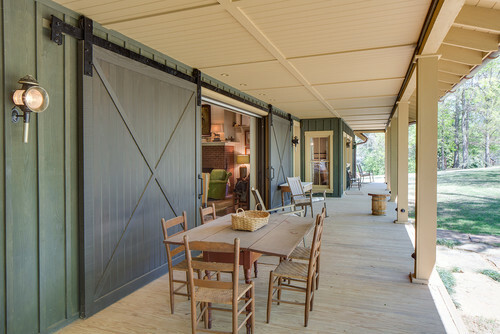 The large sliding doors look suited for horses, and the wood shingles give the building a rustic appearance. The expansive, spacious porch, however, hints at the comforts hiding inside. Entering through the large sliding doors, you’re welcomed into a comfortable living room that has warm wood floors, a gorgeous brick fireplace, and modern furnishings. 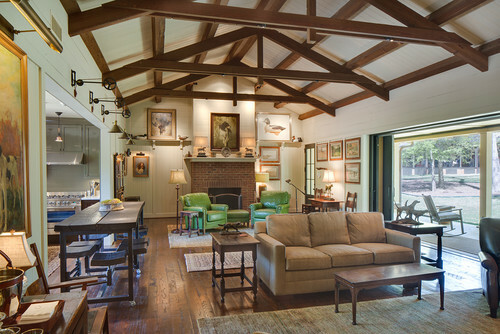 The cabin/country feel is continued by the large wood beams suspended above. Behind the living room is an open kitchen that has pristine white countertops and rich wood base cabinets. The eye-level cabinets have a grey tone that matches the crown molding. The bedrooms are comfortable and elegant. 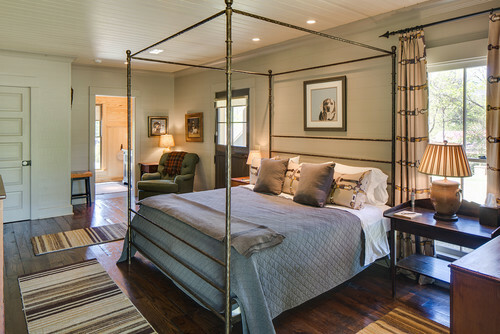 This bed with a box frame is perfect for sleeping away the country night. It’s easy to picture yourself spending a lazy afternoon on this large, rustic porch, which features wood furniture and a cozy rocking chair. The backyard landscaping perfectly fits the classic style of the entire property. 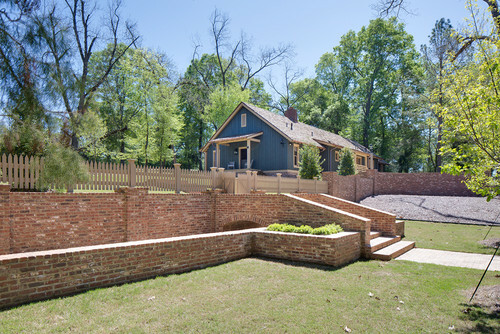 The brick walls and stairs complement the country setting. It would appear that the owners of this guest house love dogs, especially hunting dogs. Take the above painting for example. It is perfectly lit, like a display at a museum, and shows three dogs that appear to be of the spaniel variety. 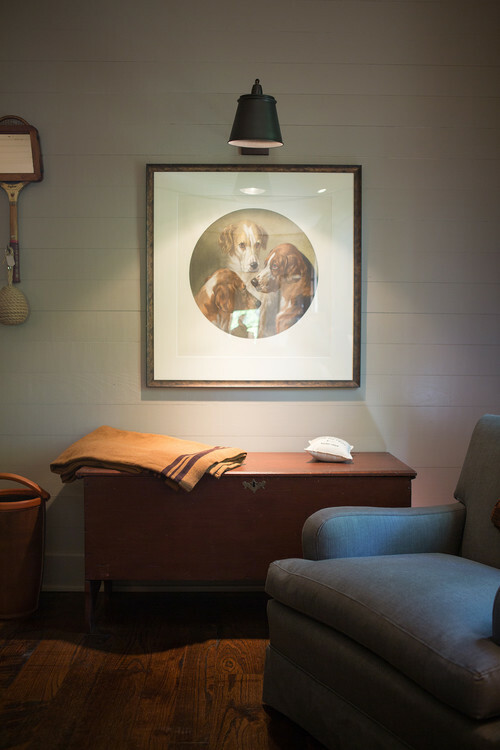 Dogs and hunting scenes can be found on many other wall paintings and table decorations. What do you think of this country guest house? Share it with your friends today! 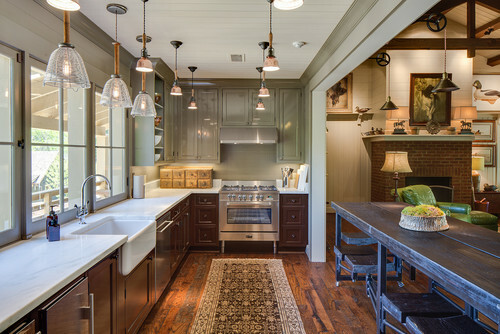 This 4400 square foot home is a combination of various floor plans tweaked to cater to the family's needs.